No other river on earth commands the respect River Ganges has. For Indians it is not just a river but a goddess who appears as a human character in Indian Mythologies. No other river attracts so many pilgrims who flock to the holy river in search of salvation. For the millions a dip in this holy waters is enough to wash out all sins one had to commit during his life on earth. For the people of India from all parts of India this holy river is a purifier of the soul. Ganges hosts the largest number of pilgrimage place on earth, old people perform pilgrimage either return with a pot-full of holy water (this is kept safe at home his kiths know this water is to be dripped in to the dying man’s mouth so that the soul will get salvation) or stay there at some ashrams and live a life praying till death (it is their wish to be cremated at the banks of Ganges and ashes dropped in the river. A famous song in Hindi follows the line “Ganga meri mam ka nam, Bap ka nam Himalay; which means “Ganga is my mother’s name and the name of my father is Himalaya” That is the affection an Indian to this holy river which is referred as ‘Ganga Mayya’ meaning ‘Mother Ganges’. Lord Shiva is pictured with goddess Ganga flowing from his head. It is said Goddess Ganga is the Wife of Lord Shiva. The 2510 km (1557 miles) journey of the Ganges from the chilly waters of Gangotri Glaziers to the Bay of Bengal is a month old saga where many tributaries join and distributaries part in its course. On its way the holy river feeds the eastern parts of the Gangetic plains- a one million sq km land mass with a population of 900 million people any way world’s most thickly populated plain. Ganges is the life bloods of this plain not only because of the much needed water it gives but the rich alluvial soil Ganges brings from the distant Himalayas nourishes the soil of the plains. The Gangotri glazier is an important pilgrimage center for Hindus (bathing in this ice-cold water is considered very auspicious for them) is the source of River Ganges. It is a mountain lake at the height of 25,446 feet above the sea-level in the Uttarkashi area of Uttarkhand state of India formed of the water from the glaziers surrounding it. With a mass of 27 cubic kms this is a massive one with a length of 30 kms and breadth of two to five kms. The terminus of the glazier resembles the face of cow and hence called Goumukh which in Sanskrit means cow-face. The main mountains which supply the glazier with water are Shivling, Thalaysagar, Meru etc. The prime source of water to the Ganges remains to be River Bhagirathi its main tributary that originates from Goumukh. River Ganges is actually a confluence of six rivers the first the Alakananda which meets Dhauliganga at Vishnuprayag, Mandakini (slow mover) at Nandiprayag, Pindar at Kamaprayag and the final one Bagirathi at Devaprayag from there onwards the river comes to be known as Ganges. The next most famous location is Haridwar (door to god) in the Shivalik hill ranges which is one of the most famous pilgrimage center for the Hindus. The Kumbhmela Once in twelve years there is a grand function held in four pilgrimage places (Ujjain, Haridwar, Nashik and Allahabad (Prayag)) by rotation. Kumbhmela (festival of the pitcher) is world’s largest crowd puller and in that merit it has gained position in the Guinness Book of World Records. The ceremony is held in Prayag by observing the position of sun, moon and Jupiter when comes in alignment. In other three places also it is the astronomical positions of sun, moon and stars that are observed for fixing the occasion. It is believed that the essence of life (by consuming which immortality can be achieved) is placed in a clay pitcher in the heaven and at times when the heavenly bodies are in compromising positions a drop of the amrut (heavenly nectar) will fall on certain places and it is that time selected for the occasion. The Naga monks who parade naked is just one of the strange rituals of this occasion. From these places the river flows nonstop to Allahabad where the main tributary of the Ganges the Yamuna River joins this meeting place is known as ‘Sangham’ (joining together) which is also a very sacred place for the Hindus and there is always the rush of pilgrims. There is one mysterious invisible river also joining this place by name Saraswati – it is said that there once existed a river which later got dried. Later numerous rivers like Kosi, Son, Gandak, Ghaghra all joins with the Ganges. At Pakaur for the first time a parting occurs when River Bhagirathi diverts this branch later comes to be known as the River Hoogly in Bengal. 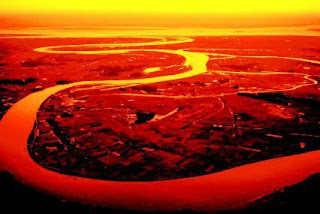 When distributaries part the main branch remains as the Padma River. Some part as some join. It is time for the river to bid farewell with India as its duty is to serve Bangladesh. There just before entering in to Bangladesh there is the Farakka Barrage (a multipurpose dam for irrigation as well as for checking silting to the port. This is a bone of contention between Bangladesh and India as the former thinks it is against its best interest. After entering Bangladesh there are two more rivers joining the Ganges or Padma; Jamuna and the Wild Bramhaputra. Meghna both distributaries of the formidable Bramhaputra that comes after circumventing the Himalayas and well known for its habit of making flash floods. . The combined water discharge of Ganges and Bramhaputra makes the water discharge as the third largest in the world after Congo and Amazon. Their silt has formed the largest deltas in the world The Lower Gangetic Delta which is peculiar to its fauna and flora dolphins like Irrawaddi and Gangetic plain dolphins are endemic to this region. Extensive human invasion has put these animals in to the verge of extinction. This place brackish during the dry season and fresh watered during the monsoon. The Sundarban (sundarban means beautiful forest) it is said that a type of mangrove peculiar to this region which is locally known as ‘sundari’ (Heritiera fomes)is the reason for the place known by that name- fresh-water Delta is nearby to it. Sundarban is famous for the animals like the Bengal Tiger, Indian Python, Clouded Leopard etc there are large number of crocodiles and aquatic creatures. A clean Ganga alone will clean the nation. If River Ganges is revered as a giver of life, there is no exaggeration in it as this holy river gives food, water and livelihood to millions of people and without which India would not have existed. These devotees flocking to this river in large numbers are actually the problem the river is facing now. Waste materials from the pilgrims in extra-large numbers have made the river polluted to the extreme. Rajiv Gandhi the former Prime Minister of India had proposed a scheme for keeping the river clean (Ganga Action Plan) and all those had crashed for lack of political will on the part of the authorities. Now the ball is on the court of god himself as no machinery had been useful for saving the life giver without which there would have been no India or a culture with Indians boast of as their own.